Doctor Who returns to BBC America: Sadness, mortality, and wisdom in science fiction. The most nakedly emotional show on TV just might be the nerdy British series with time-traveling and aliens. Photograph by Adrian Rogers/ BBC. Two strangers arrive in a rural village and befriend a depressed, lonely painter. They help him realize that his unique way of looking at the world isn’t due to madness; in fact, he has a special gift that will one day be truly appreciated. But when the visitors tell him they must depart, the artist takes to his bed and weeps bitterly. “When you leave—and everyone always leaves—I will be left once more with an empty heart and no hope,” he wails. If you thought that was a storyline from a Lifetime movie of the week, or some other estrogen-infused feelings fest, you’re dead wrong. In fact, it’s the plot of “Vincent and the Doctor,” an episode of Doctor Who, the long-running nerd-favorite of a BBC series about a Time Lord who roams the universe, accompanied by a string of companions, in a time-and-space machine known as the TARDIS. Doctor Who has been thrilling geeks and sci-fi fans since 1963, but since it was revived in 2005, it has become not just a mainstream hit but, fascinatingly, one of the most openly emotional, soul-stirring shows on television. 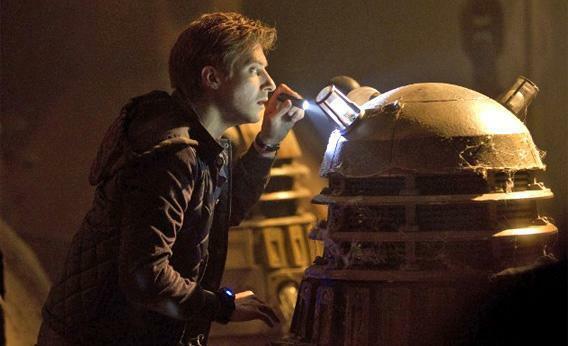 Doctor Who, which returns to BBC America for a new season this Saturday, is smart and sassy. Unlike most British series that make it to U.S. screens, its diverse cast includes working-class and Northern characters who aren’t servants or scumbags. It’s also the product of Britain’s best TV minds: The original showrunner Russell T Davies (Queer as Folk, Bob and Rose) and his successor Steven Moffat (Press Gang, Coupling, Sherlock) are responsible for some of the most provocative shows of the last 20 years. The new Doctor Who honors its predecessors in its ordinary effects (there’s nothing special about them), its ridiculous battles with alien life forms—in “Vincent and the Doctor,” the Doctor squares off against the krafayis, a particularly pathetic chickenlike monster that (perhaps for budgetary reasons) remains invisible for most of the episode — and the Doctor’s antic affect, silly and overenthusiastic like a Labrador puppy. Since I was a child, these features of Doctor Who have prevented me from truly enjoying the show, and they still annoy me. And yet the modern reboot consistently makes me cry. Why? I suspect it’s my age. Doctor Who’s most enduring obsession is with time and the ways its passage makes us all mad, sad, and lonely—in other words, the anxieties that plague us in midlife. The Doctor teaches us how to grow old. Like middle age, the show is studded with sudden losses. In the brilliant (even to a skeptic like me) Season 3 episode “Blink,” two characters are abruptly thrown decades into the past, separated from their 2007 friends and family, and left to rebuild their lives all alone. Fortunately, the time-travelers find ingenious ways to communicate with the loved ones they left behind in the future. It’s as though the show is warning viewers not to take people for granted, urging them to appreciate the here and now. A visit from the Doctor is like a blast of enchantment, but moments spent with him can make the rest of a lifetime feel dull by comparison. In Season 5’s “The Eleventh Hour” he drops in on a 7-year-old, who then spends the next 12 years obsessing about the strange, wonderful visitor who abruptly disappeared. Pining for the Doctor might remind viewers of a certain age of those occasional wishes to turn back the clock and return to healthier, happier times. The Doctor knows all about being alone. He’s the sole remaining Time Lord, the last of his race, and as Madame de Pompadour discovers when she accesses his memories in Season 2’s “The Girl in the Fireplace,” he was a “lonely little boy. Lonely then and lonelier now.” The Doctor, who can regenerate into a new body when necessary, shows us that loneliness is the price of immortality. It’s a very 21st-century ambivalence: Everyone wants to live forever, but no one wants to outlive their loved ones. Nor do they want family members to forget their time together. As the New Yorker’s Emily Nussbaum noted in a recent article, in the last two seasons, the Doctor has found his soul mate, River Song (Alex Kingston). Although they run into each other at hot spots across the universe, their timing is awful, because they’re heading in opposite directions. “Every time we meet I know him more, he knows me less,” she says. “I live for the days when I see him. But I know that every time I do, he’ll be one step further away.” It’s a sad fate not unlike the perspective of a woman losing a spouse to Alzheimer’s. Her next line makes the tragedy more explicit: “The day’s coming when I’ll look into that man’s eyes—my Doctor—and he won’t have the faintest idea who I am. And I think it’s going to kill me.” Still, she won’t let the Doctor see her diary, because she wants to protect him from “spoilers.” Even if love is doomed, we should enjoy it. The Doctor also comforts us as our own memories fade. Sometimes, to maintain the structural integrity of the universe, he must wipe his companions’ memories clean. When Donna Noble—played with chippy gusto by Catherine Tate—realizes that after many wonderful adventures together, he’s going to send her back to her unglamorous life as “a temp from Chiswick,” she begs for a reprieve. But like a real doctor, he must sometimes be the bearer of bad news. “I am so sorry,” he tells her, “But we had the best of times.” It’s a comfort. In this fictional universe at least, for everything that’s taken away, something is given. Doctor Who’s world is one of endless possibilities—love, or a new life, is always around the corner. Only the immortal Doctor can regenerate, but anyone can reinvent themselves—shop girls and strippers can become companions to a universe-hopping Time Lord, and a woman ripped out of 2007 can build a new family in 1920. In the end, though, there’s only one possible conclusion to every storyline. As the Doctor says in Season 1, “Everything has its time, and everything dies.” Doctor Who prepares us to say goodbye.